Ustad Allah Rakha was born in Muzaffar, a village in Sialkot District, in 1932. During early childhood, his family moved to Amritsar where he was raised. He acquired his initial education in classical music and sarangi playing from his father, Ustad Lal Din. Later, he became the student of three renowned sarangi players, Ustad Ahmadi Khan, Ustad Allah Diya, and Ustad Nathu Khan. His talent was first appreciated in his early teenage years when he performed in a contest at a local wedding, and was lauded for his performance of Raga Desi. After partition, Allah Rakha migrated to Pakistan, and settled temporarily in Karachi, where he also remembers to have had the honor of playing live for Mohammad Ali Jinnah. It was also here that he met Ustad Bade Ghulam Ali Khan and honed his skills as a sarangi accompanist. He moved to Lahore in 1948, and for almost two decades, he worked at the Radio Station, and in the film industry as a recording artist. In Lahore, his knowledge of music was further broadened during his association with Ustad Sardar Khan(vocalist), son of Umrao Khan, and grandson of Tanras Khan. 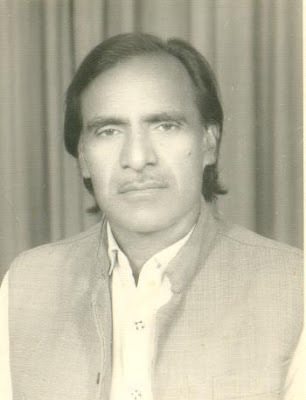 He moved to Rawalpindi in 1968, and became a regular employee of Radio Pakistan, Rawalpindi, where he served till his retirement in 1992. In 1994, he was awarded the Pride of Performance for his lifelong devotion to classical music. He has also traveled abroad several times and performed in Afghanistan, Sri Lanka, India, China, Dubai, France, Hungary, Italy, England and Germany. His music it´s very deepest and amazing.. So wonderfull. Good to find recordings of Khan sahib on this website. How unfortunate that Radio Pakistan could not preserve a single recording of this great artist. I am privileged that the Darbari item appearing on this website has originated from my personal collection. I made this recording in the music studio of Radio Pakistan Rawalpindi in 1992 where I served as a program producer till 1993. Fortunately, I preserved a personal copy which I entrusted to Nazir Khan, an avid music listener of Rawalpindi, for presenting it to Dr. Taimour. My friend late Dr. Adam Nayyar believed dissemination is the best way to preserve.